Bajaj Pulsar 220 F price in Mumbai starts from Rs. 97,670 (Ex-showroom). Pulsar 220 F is available in only 2 variant. The top-end variant Bajaj Pulsar 220 F ABS is priced at Rs. 1.05 lakh. Bajaj Pulsar 220 F's top competitors are Bajaj Pulsar NS200 (price starting at Rs. 99,283 in Mumbai) and Yamaha R15 V3 (price starting at Rs. 1.39 lakh in Mumbai). Q. Should I buy Pulsar 220 F ABS version in current time, my budget is 1.20 lac, suggested any other bike. I want bike over 200cc. Q. 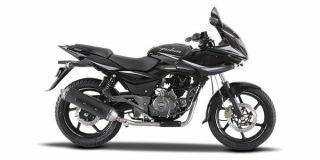 Which is best between Pulsar NS160, Pulsar 220 F and Duke 125 in terms of mileage and on road price? Which is the best between ns160 and apache rtr160 4v...? Q. What about the maintenance cost of Pulsar NS200 and Pulsar 220F? Please suggest me. Q. What is the maintainance cost of Bajaj Pulsar 220F for year? Q. Which is well maintain easily, NS 200, Pulsar 220F or MT-15 for daily use?